· The Pierce Aerial ladder fire truck is the only ladder truck in the southern part of Country. · The Firetruck has the electrical capacity to power the hospital during emergencies and outages. Westminster, Maryland, January 22, 2019. 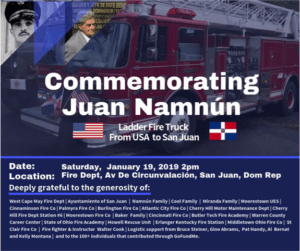 To further the legacy of Juan A. Namnún Yilbe, the Namnún family fulfilled a commitment to their late Father while building a bridge between the United States and the Dominican Republic. 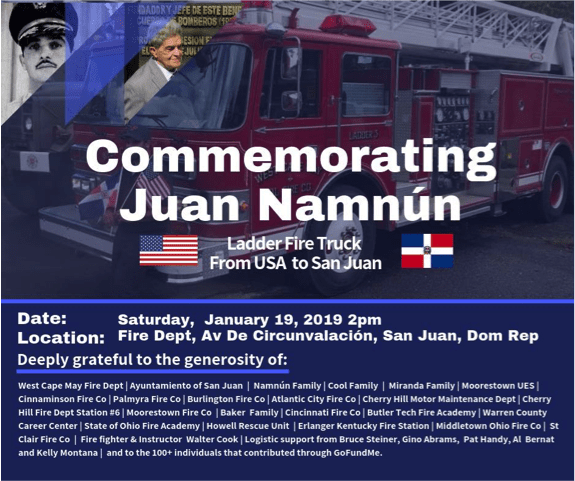 Along with personal financial contributions, Juan Namnún’s children sought the support of their American friends and organizations through a GoFundMe campaign that would allow them to raise the money needed to acquire a modern fire ladder truck, which was donated and delivered January 19, 2019 to the Fire Department in San Juan de la Maguana, where Don Juan Namnún had been the Founder and Colonel of the Fire Department. “As a family of Dominican immigrants, we always seek to strengthen the ties between the Dominican Republic and the United States. For me, as a Dominican entrepreneur in the United States, I wanted to honor my Father and at the same time further connect my children to our cultural roots. We are grateful to all of the local organizations that have supported us to bring this much-needed help to San Juan de la Maguana, without their support it would not have been possible,” said Verónica Namnún Cool, Namnun’s daughter and founder of Cool & Associates LLC. “During conversations with my father, I sensed the tremendous love and dedication he had for his family, his community, and his people. Although we emigrated to the United States, his commitment to his beloved San Juan never wavered. I wanted to commemorate that patriotism with this truck. Living in New Jersey, I will continue to strengthen these relationships that we have created with the American Fire Departments to deliver more equipment and coordinate training between Dominicans and Americans. I hope that my Father feels proud of our efforts,” exclaimed Juan A. Namnún, son of the Founding Colonel. The donation of the fire truck raises awareness within American organizations of the basic needs in other countries. An opportunity for international collaboration surfaces when equipment is replaced or upgraded within American fire companies. 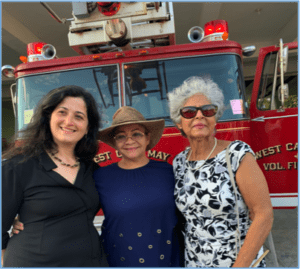 In this vein, the Namnun family was able to also collect donated tools and equipment that filled a 20-foot container with vests, boots, gloves, fire masks, stretchers, and much more from over 40 fire companies across the Mid-Atlantic and Northeast. Additionally, services such as security, logistics services, marketing, and transportation were donated, valued at more than $25,000. “Even in the Santo Domingo, the capital of the country, does not have a fire truck as modern as the one we received. Thanks to the efforts of the Namnún family, we can now handle emergencies throughout the region. The fire truck even has an electrical system that has the capacity to power the hospital during emergencies and outages,” explained Víctor Michelen Rodríguez, head of the Fire Department of San Juan de la Maguana. This tremendous commemoration would not have been possible without the help and collaboration of: West Cape May Fire Dept, San Juan City Council, Namnún Family, Cool Family, Miranda Family, Moorestown UES, Cinnaminson Fire Co., Palmyra Fire Co., Atlantic City Fire Co., Cherry Hill Motor Maintenance Dept., Cherry Hill Fire Dept Station # 6, Butler Tech Fire Academy, Warren County Career Center, State of Ohio Fire Academy, Howell Rescue Unit, Erlanger Kentucky Fire Station, Middletown Ohio Fire Co., St. Clair Fire Co., Fireman Walter Cook, Logistics Support from Bruce Steiner, Gino Abrams, Pat Bernat, Kelly Montana, and more than 100 people who contributed through GoFundMe. 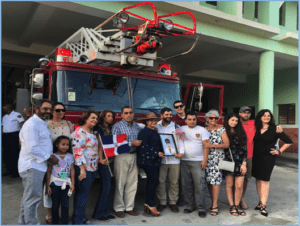 In November 2016, the Municipal Council of San Juan de la Maguana recognized Juan Namnún as founder of the Fire Department of San Juan de la Maguana. Juan Namnún was also a leader in sports in San Juan de la Maguana, helping to take the baseball team to compete in Colombia in 1975. 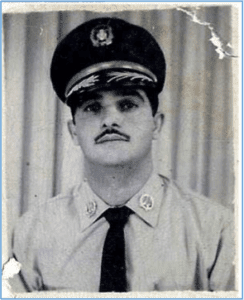 The Fire Department of San Juan de la Maguana was founded in 1951 by Juan A. Namnún Yilbe, who served as fire chief until 1974. It was during his tenure that the first fire truck arrived at the Station of the Corps of Firemen of San Juan de la Maguana in 1973. In 1995, the Main Station of the Fire Department of San Juan de la Maguana was built, as a result of the joint work of the community and the central government. Cool & Associates, LLC helps corporations, businesses, non-profit organizations and government agencies to effectively engage the large Hispanic market in the United States. The consultancy provides essential tools and services for clients, such as marketing and communications, outreach campaigns, training and support for work staff, and diversity and inclusion workshops to attract businesses, clients, donors and Hispanic students. Cool & Associates, LLC is a certified Minority Business Enterprise (MBE), established and operated by Verónica Namnún Cool, Dominican, who works proudly to help clients engage with the fastest growing segment of the U.S. population: Hispanics.